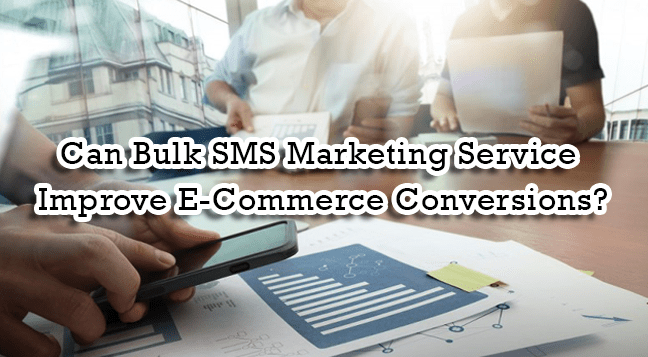 Can Bulk SMS Marketing Service Improve E-Commerce Conversions? Can Bulk SMS Marketing Service Improve E-Commerce Conversions? E-Commerce Companies and online portals have to stay connected with the customers and provide them with timely updates and offers on a regular interval. With the internet revolution, the E-Commerce sector was one of the sectors that were benefited a lot. Today, the popularity of the internet is in full swing and almost every person is now having an access to the internet. The world is witnessing the digital revolution. The Internet has totally changed the way how things are done. From shopping to ordering food, connecting to friends, online movie ticket booking. Everything can be done with just one click. With the popularity of the E-Commerce sector, this makes it one of the most competitive sectors as well. To take an edge over the competitors, E-commerce business has to work an extra mile. Customers are attracted to the business that provides better products, services, and better customer satisfaction. E-commerce marketers have to communicate with their clients on the daily basis. Businesses have to try and use versatile and new channels to communicate with the clients. One such method that is convenient and has a maximum outreach is the bulk SMS service. In the world of digital revolution, almost every person is having an access to the mobile phones. The main advantage of SMS is that it does not require internet access. Any ordinary phone with simple functionality can be used to send and receive the SMS. During the past decade, Email marketing was one of the top choices of digital marketers. But with the passage of time, there was a drop in the effectiveness of Email marketing. Bulk SMS marketing is still one of the effective marketing methods. SMS has a high opening rate as compared to the emails. Also, SMS have a high outreach as compared to the Emails. The average opening rate of SMS is 10 sec. These factors make SMS service as one of the favorite marketing methods for digital marketers. The popularity of the E-commerce sector online portals have evolved tremendously over the past few years. E-commerce sector has gained a huge popularity and trust in recent years. So, it has become necessary for the E-commerce sector to stay connected with the customers and provide them with timely updates. As an e-commerce website owner, the process of bulk SMS is to send a large number of SMS to the target audience. This audience comprises of past audience, buyers, visitors of the website etc. E-commerce business owners are well aware of the fact that a small improvement in the conversion ratios can have a huge impact on the sales of the business. These are the areas that need improvements as an online seller website. The aim of online marketer must be to improve the conversion rate of the website. Bulk SMS is the highest conversion channel of all time. Let us look at how bulk SMS service can improve the conversion rate of the E-commerce sector. For any business, the customer is the main driving force. Customers are the one who is using your product and services. Bulk SMS can be used to improve the customer support service. You can get a survey done using bulk SMS, get reviews, the insight of your products and services, and more. If the customer gets a faulty or damaged product, they can send an SMS to the customer support team and get the issue resolved. This ensures a smooth return process and improves the user experience. You do not want that any customer becomes your one-time buyer. You want the customer to visit again and make purchases. Bulk SMS service helps in customer retention and also encourages them to buy more products. You can send promotional offers, discounts, festive offers to the clients. This will increase the traffic on your website and also help you to increase your sales. Looking at the increasing number of fraudulent activities, online payment checkout is one of the processes that discourages the buyers from completing the purchase. E-commerce websites can secure payments by using a two-way authentication process. The customers will be sent a one time password to their registered mobile numbers before the payment is accepted. This makes the payment process more secure and credible. This protects the customer bank and card information from hackers and cybercriminals. Bulk SMS is a great way to improve the conversion rate in the E-commerce websites. Shopping carts conversions can be improved by sending reminder texts, discounts and offers to the customers. This can also direct back the lost buyers to the website. If your system notices that the user has added items to the cart, you can send them reminders and offers on their cart. This will encourage them to complete the payment. E-commerce websites can also run the Loyalty programs with the help of bulk SMS service. Reward your frequent and loyal customers by offering them discounts, offers, and coupon codes. This will boost the purchase and sales of the website. You can also send offers and discounts to new customers. These customers can become your loyal customers in the upcoming future. You can also send exclusive offers to the most frequent buyers by using bulk SMS service. If you are looking for ways to improve sales, traffic, and conversions on your E-commerce website, you must take into account the Bulk SMS Marketing Service Improve E-Commerce Conversions. Bulk SMS service is one of the favorite marketing methods for big brands also. Digital marketers need to use as many channels for marketing methods. So, you need to keep your mind open for new and versatile technologies for marketing.